The official records of England are the focus of this volume - their origin, their use, and what they reveal. 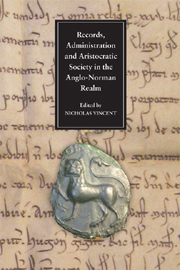 The major theme of this volume is the records of the Anglo-Norman realm, and how they are used separately and in combination to construct the history of England and Normandy. The essays cover all types of written source material, including private charters and the official records of the chancery and Exchequer, chronicles, and personal sources such as letters, while some 100 previously unpublished documents are included in a series of appendices. There are studies here of particular Anglo-Normans, including a great aristocrat and a seneschal of Normandy; of records relating to Normandy surviving in England; of the Norman and English Exchequers, between them the financial mainstay of the king/dukes; of the controversial origins of the English Chancery records; and of Rosamund Clifford, the King's mistress. CONTRIBUTORS: NICHOLAS VINCENT, DAVID CARPENTER, DAVID CROOK, MARK HAGGER, DAVID CROUCH, MARIE LOVATT, DANIEL POWER.